Synopsis: In this classic book from Eric Carle, a ravenous caterpillar eats, eats, and eats until he turns into a beautiful butterfly. Bilingual benefit: Both the English and Hebrew versions introduce counting and the days of the week. 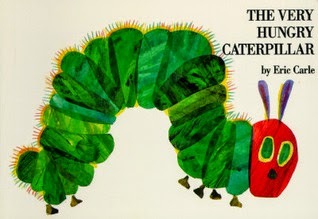 In addition, the board book version is fun for little fingers with its different sized pages and holes in the food items that the caterpillar has eaten. Non-native or new Hebrew-speaking children might enjoy reading the Hebrew version in conjunction with the classic English version. Lil guy: An occasional read with Mama. More often “reads” it to himself. Mama: Although I enjoyed this book as a child, it did not speak to me as an adult. 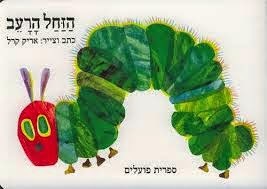 However, my son enjoys it and my hubby, who is a native Hebrew-speaker and did not grow up with the book, often refers to it when commenting on our toddler’s eating habits. As it is readily available in English and Hebrew in Israel, it may be worthwhile to add it to your personal library or to borrow a copy from the public library, the preschool (גן), or a friend.